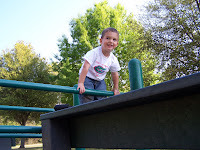 Last Friday the boys and I hung out at the park with a couple friends. 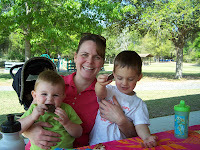 We try to get together for "mommy & me" playdates once or twice a month. Katie and Luke made it, as well as, Terri and Sammy. 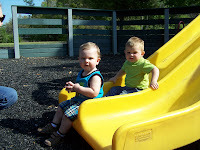 He and Daniel mastered the slide. 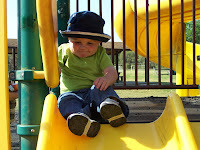 Daniel's doing great, he does the slide all by himself now and tried to climb, the very big, jungle gym. He is quite adventurous. 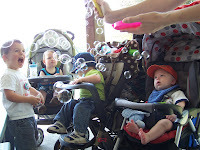 Terri had a bubble blower, which made mine look sad, that the kids loved. Look at David's laugh! Isn't he great? I swell up inside when he laughs like that. The weather was beautiful. Wish I had a pic of Luke and his sunglasses, he was so cool. I am so grateful that God has blessed me with these women to hang out with. It has been a prayer of mine for awhile. It is refreshing to vent, encourage, pray, and laugh with such great people. Thank you Lord. MIss you, Friend. Sad we haven't playdated in awhile. Must get back on it. I still haven't forgotten that I forgot your money for the eggs. I feel awful. Will be back in G'vill tomorrow. Call me this week. Great blog and LOVE the pics!